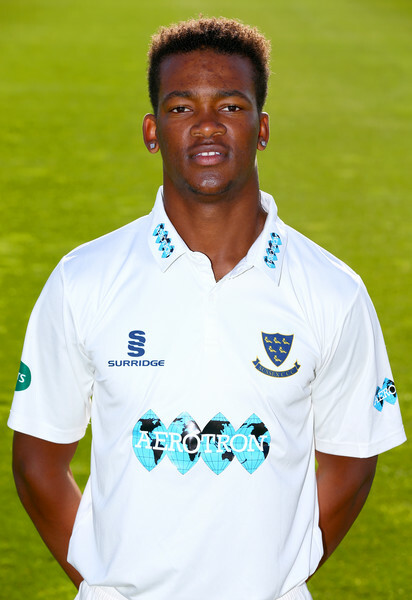 Bermuda’s Delray Rawlins and his Sussex Cricket Club teammates maintained their perfect pre-season tour record with a 57-run win over Durham University at Claremont Cricket Club in South Africa. Better-known for his lightning-quick bowling, George Garton demonstrated his ability to bat at pace with a blistering century from number seven, before Sussex’s bowlers strangled the life out of Durham’s chase. After being put into bat by the students, Sussex found themselves struggling at 18 for two after six overs, following the dismissal of openers Harry Finch and Tom Haines in consecutive overs. Rawlins followed shortly after, before Stiaan van Zyl and Michael Burgess put the innings back on track. Offering further encouraging signs ahead of his return to the county game following a knee-injury last May, van Zyl made a stylish 33 to go with his unbeaten 70 from the first match of the tour. Burgess, meanwhile, was busy compiling a half-century off 51 balls. He was joined by Luke Wells when van Zyl was bowled by a fine Joe Emmanuel delivery, who himself was then stumped soon after. That brought Garton to the crease, who laid into a bowling attack shorn of two seamers after they had succumbed to injury. There was plenty of careful placement and quick running in amongst the big hitting, a combination that saw him also reach fifty from 51 balls. After Burgess was caught for 68, Garton was joined at the wicket by Will Beer. The pair showed no mercy, dealing predominantly in boundaries as they upped the scoring rate significantly. Garton eventually fell for 114 off 83 balls, the 64 runs he scored after reaching his half-century coming from 32 deliveries and his final 30 runs were made from just nine. In total, the innings featured 14 boundaries. Beer’s 24 came off 15 balls. His dismissal gave Emmanuel his fourth wicket, but they came at a price. The seamer’s 13 overs cost 97 runs. Sussex’s tail saw out the remainder of the allotted overs so that Sussex finished on 291 for nine of their 50 overs. Durham University made a solid start in reply, reaching 91 without loss, but they had taken 26 overs to get there and were never able to keep up with the required rate. Danny Briggs took the first wicket, trapping Benjamin for a watchful 49. Spin did the trick for the second wicket as well, as Luke Wells bowled Scott for 36. Opening batsman, Solomon top-scored for the students, making 55 off 81 balls before he was lured down the wicket by Will Beer and stumped by Michael Burgess with the score on 160. Emmanuel – who made an unbeaten 51 from 33 balls - and Tom Hewison (25 off 31) found some rhythm during their partnership of 74, but the accelerator had been pressed too late and despite having seven wickets in hand, Durham found themselves a long-way short of their target when their fifty overs were up.